There is nothing more frustrating or painful than watching as your hometown is torn apart while you sit in safety several hours away. Hurricane Sandy struck my hometown, Toms River, N.J., on Sunday Oct. 28. The storm hit the shore full force and in the course of one night, everything that I loved about growing up on the Jersey Shore was completely wiped out. 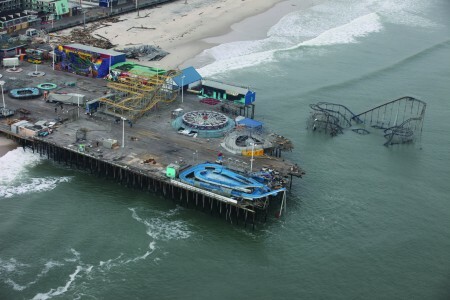 It may just seem like childhood memories to some, but my entire life was spent on the beaches and boardwalks that Sandy stole from us. The first roller coaster that I ever rode is now just a twisted piece of metal. The boardwalk that I have walked every summer since before I was old enough to remember is left in splinters, in the sections where there is boardwalk left, that is. There are some places where it is just gone all together. The ocean has completely overtaken the beaches that I used to lounge on for days at a time. It was where I laughed, and played and learned about everything that I love about life. From the comfortable bubble that is Mason, it is hard to see the true impact of Hurricane Sandy. Sure, it was a lot of rain and some nasty winds but not much more than that. Students rejoiced over the fact that classes were cancelled for two days. Some simply saw it as Mother Nature’s permission to slack and catch up on rest. When all was said and done, there was no real damage to campus and just a day later, we are already back to business. Everyone seems to be complaining about getting back to work and about being held responsible for assignments that were due days ago. Very few seem to see the significant damage that was done to my home state or even care for that matter. I wish that I could make them understand what it was like to end a summer night kicking waves walking along the beach while the lights and sounds of a crowded boardwalk filled the air. Maybe then they would understand what was lost. I feel blessed to say that I did not lose any family members to the storm, and our property sustained minimal damage. However, so many of the families in my community and others along the coast line were not so lucky. Homes are flooded, shore businesses are in ruins and some families have lost everything. Despite it all, I am confident that my hometown will be rebuilt. The power may not have been restored just yet, but the clean up has begun. Schools have become shelters and an army of volunteers is preparing to rebuild our communitY. I would give anything to be there to help them. As frustrating as it is being hours away and unable to join the relief efforts, it is inspiring to see the way that my community is coming together to take back our shore. I have no doubt that we will come through this, because together we are Jersey Strong.